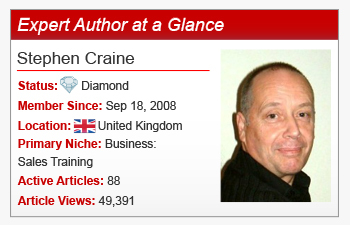 Sales manager and trainer, Expert Author Stephen Craine shows his readers and clients how to invest in themselves so they can get the most out of their work and enjoy life. Beginning with a foundation of articles based on everyday procedures, Stephen soon learned there was great success in writing engaging articles that integrated real-life events to areas of his niche. “One of my most successful articles was based on what I saw happening while I was having new windows fitted at my house,” he commented. Noting the window-fitters’ poor attitude to passersby’s inquiries, Stephen was inspired by the lost opportunity to sell more windows. Gaining inspiration by events, advertisements, sales calls, and other ideas he jots down in his notebook, Stephen writes quality articles to build exposure and attract visitors to his website. Although reluctant to publish articles in the beginning, Stephen found it was well worth the effort to extend his credibility through his articles in order to build an online presence. Check out more highlights from our interview with Stephen below! What are 3 article writing challenges you’ve faced and how did you overcome them? #1 – Worrying that people would be critical about my article content. To overcome this, I looked at my experience and thought: After managing sales teams all this time, I must have picked up something useful that people will want to read. #2 – Getting my ideas into a logical order that communicated what I wanted to say … For me the most useful tools have been the Article Templates. They have helped me to communicate my message in an effective way that follows a logical path. The templates have also helped me to form ideas as the basis for articles. I was a complete beginner when it came to writing articles and planning out the article into neat sections kept them short and to the point, it gave them purpose … I would recommend all new writers use the templates. #3 – … I would try to target as many people as I could (sales roles, business owners, marketers …). Now I have the confidence that the articles will work best to attract readers and visitors to my website if I aim them at specific groups of readers. If you had to start over again, what would you change? I would write many articles with a common aim as part of my marketing plan at the same time. [It] has taken me a couple of years to learn that this is the way I get the best results. At first I would write an article because I had a good idea, then I would look for a page on my website and link the article to it. I would recommend to new writers that they first think about what they want to achieve, where they want to send their readers, what they want to gain, and where article writing fits into their business plan. Take Stephen’s advice to discover how you can reach new heights of success with your efforts by coordinating your article writing plan with your business plan. Do you have a question or comment for Stephen? Feel free to leave it in the comments section below. On My.EzineArticles.com? Add Stephen to your Network! I have articles and links to things seniors will enjoy. Loved the insight. I really appreciate you sharing what you have learned. Patrick. Philip , Thank you for your kind comments. Hi Stephen. Congrats on the publicity and thanks for sharing your 3 tips on how to overcome your common article writing problems. Thanks for the insight and advise. Please is there a difference between American and British English? Hi Moronke, Yes there are differences; some words are spelt different but this is not so different that it detracts from the message. Some different words are used; for example English drivers use bonnet and boot for the front and rear compartments of the car while Americans use hood and trunk. On the whole you can use either American or English words and terminology for both countries and be understood. Everything about article writing boils down to one thing – write, write and write some more. There are no secrets. Just dogged perseverance and the hunger to learn – both of which are uncommon for people without the passion to do it. thank you for sharing us your 3 tips to overcome the writing problems. Very informative, Stephen! You also gave me good inspiration. I have also published articles here since 2008 and I agree with your final statement. If I could do it over again, I would have a marketing plan in place and focus my articles more strategically in my niche of Healing Through Love. And yet, I have loved writing freely about so many other topics and have a place to have these articles available to be shared with a huge global audience. Hi Stephen. Congrats on the publicity! Thanks for sharing your challenges, Stephen, and more importantly, the solutions you used to overcome them. Very helpful advice thank you.